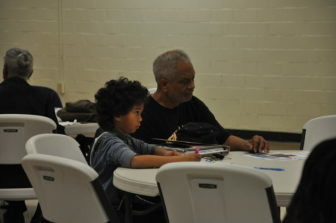 Alex Lafargue and his nine-year-old son, Alongkoin, attend a meeting of the Erase the Board coalition. Alex brought his son to many meetings for months as he tried to fight to keep the third-grader’s school, Nelson Elementary, open. Parents anxiously await New Orleans’ enrollment lottery results from the time they submit applications in late February to mid-April, when the mysterious algorithm that controls every child’s school placement spits out answers. “It doesn’t allow for hopes to be brought about in a timely way,” parent Alex Lafargue said. His son attends Medard Nelson Elementary School, a Gentilly charter school rated F by the state for the last four years, a rating based largely on students’ performance in state standardized tests. Nelson is slated to close at the end of the school year, one of five schools that the Orleans Parish school district decided to close this spring. Lafargue wants his nine-year-old son Alongkoin to attend a new charter school, IDEA Oscar Dunn, in eastern New Orleans this fall. Rounding out his top three choices were Bricolage Academy and Ben Franklin Elementary. One of his top priorities for a new school was the length of its remaining charter contract. In most cases, including Nelson’s, the Orleans Parish school district waits until a school’s final year in its multi-year agreement to make a closure decision. Each of the schools on his list has at least 4 years left on its contract. Lafargue said he doesn’t want his third-grader to have to switch schools again. “I’ve specifically looked for schools that had three or four years,” Lafargue said. Benjamin Franklin and Bricolage both enjoy good reputations. And Oscar Dunn, operated by IDEA, a nationwide charter group, is a new school, meaning it won’t face a renewal, and possible closure, for several years. “They have a four-year grace period so I can have some assurance that my child will be there for four years,” Lafargue said. District officials say the formula takes students in closing schools, like Alongkoin, under special consideration with the aim of sending them to a better school than they’re leaving and offering some reprieve from what can be a hectic final year in a school slated for closure. This year, five schools closing for various reasons have the perk. Three schools rated F for many years are closing as their contracts run out. Harney elementary, a formerly C-rated school that dropped to a D after facing leadership and financial problems, is closing. And Cypress Academy, a C-rated school the district rescued from immediate shutdown last spring, is closing again. About 980 students will receive closing school priority for the 2019-2020 school year. Closing school priority is not the only special consideration in the formula, though according to a 2018 state audit of the OneApp system, it is the most important. The district spends months finalizing student data in several different data sets, such as whether they are in a closing school. The district also confirms sibling status, address, and other factors that could influence a student’s enrollment. Each charter sets its own enrollment priorities, most have sibling priority and many also have ZIP code priorities. This year, the district introduced a new priority for students within a half-mile of a school. When parents and advocates complain that OneApp doesn’t work because they didn’t get their number one choice, charter school advocates are often quick to point out the flaw is not the OneApp system, but the lack of high-quality schools in the city. There simply aren’t enough A-rated schools to fill the demand. Amanda Aiken, the district’s Senior Chief and Portfolio Officer, said that while school performance is the most important factor in a decision to close a school, the district looks at other things as well. For example, she said the district also considers where schools under consideration for closure are located and whether there are nearby operators. “Are there higher performing schools that they can access easily?” Aiken said. According to an internal district analysis presented in February, there is an excess of open seats in elementary schools for the approximately 980 students in closing schools. Only 362 of those open seats are in highly rated A and B schools. There are an additional 1,289 open seats in C-rated schools. The remainder — 2,503 open seats — are in schools rated D or F or new schools that have not yet been rated by the state. 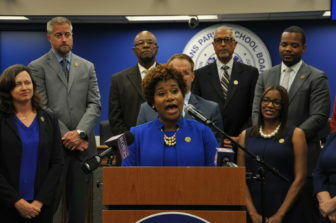 While students at closing schools get prioritized in the lottery, Aiken said, some schools also prioritize siblings of current students, children of staff members or students that live in certain zip codes. “Every school has eligibility and prioritization,” she said. The two are normally not in competition with each other, Aiken said. Students receiving closing school priority are generally midway through a school, first grade through seventh grade, she said. Normally, students utilizing sibling priority are entering a school in kindergarten or 9th grade. The district is expanding seats at highly rated schools where competition to enroll can be fierce. In the last few years, B-rated Audubon Charter School opened a second campus and InspireNOLA, which runs an B-rated elementary school** and A-rated high school, has taken over two schools: Dwight D. Eisenhower elementary and McDonogh 42 Charter School. That is all part of the plan to encourage strong operators to open more seats to students, district officials say. Edward Hynes Charter School, an A-rated school, is opening a second campus in partnership with the University of New Orleans. Children of UNO employees will have priority enrollment there. Some have questioned the the joint venture, in part because UNO previously had a partnership with New Beginnings Schools Foundation, which runs Nelson. Bricolage Academy, a school on Lafargue’s list, is rated a C.* At a charter school board meeting in March, Bricolage CEO Josh Densen told the charter school’s governing board that the district had asked him to expand. But the school wasn’t ready yet, he said. While parents and students may not get their first choices on OneApp, there is a more important question looming in some people’s minds. Does the enrollment lottery keep poorly performing schools open longer? Does OneApp keep poorly performing schools open longer? While OneApp offers students across the city a chance to get into highly rated schools, there is also concern it keeps poorly performing schools open longer. If the market truly controlled education in New Orleans, A-rated schools would theoretically expand quickly — tripling or quadrupling in size to meet demand — while F-rated schools would shutter due to lack of state per-pupil funding. OneApp essentially places a control on the marketplace. The district encourages families to list as many schools as they want, to help control the process. Parents can place up to 12 schools on the list. This year, only seven schools in the city were rated A, and four of them don’t participate in OneApp. So if a parent uses all 12 slots, it’s more likely that some of their “choice” schools will be lower rated. Sometimes families only list a few schools, hoping that OneApp won’t push them to lower-performing or farther away schools. If students don’t get into one of their selected schools in the first-round of OneApp, or even the second round, they go to late enrollment. In late enrollment, which occurs over the summer, parents still looking for a school must physically go to enroll their student. Enrollment is based on a first-come first-served basis and the lottery is not used. The past several summers, this has occurred at Dillard University. There, parents meet one-on-one with a district enrollment employee who shows them all the remaining options by grade-level in the city, which are generally lower-rated schools. Caroline Roemer, the director of the Louisiana Association of Public Charter Schools, acknowledges the lottery could be keeping some schools open longer by sending them students and the tax dollars that come with them. “But at the same time we don’t have enough high-quality seats for everyone to probably say, ‘I got the school I love and is perfect,’ ” she said. Lafargue does not want his son to attend any of the schools close to his house. Three of the nearby schools he listed — KIPP Believe, Arthur Ashe Charter School and Langston Hughes Charter Academy — had C ratings this year. Their assessment scores were significantly lower than their growth scores, a new measure included this year. If the schools were rated on test performance alone, none would score higher than a D. Lafargue said he’s worried they could face closure before his son ages out. Lafargue said New Beginnings encouraged him to send his son to another nearby school: D-rated Pierre A. Capdau Charter School, which is also part of the New Beginnings charter network. But said he wants out of New Beginnings. The network has recently come under intense scrutiny after The Lens reported allegations of grade-fixing at its John F. Kennedy High School. The network’s CEO, Michelle Blouin-Williams has also been accused of falsifying public records to secure a lucrative contract for bus operator Scholars First. Blouin-Williams was recently suspended with pay, and the network’s governing board has hired a law firm to investigate both issues. Jones said Capdau initially showed up as his son’s current school when he was trying to fill out the OneApp. That means if he hadn’t selected other schools in the lottery, his son would automatically be placed at Capdau. The New Beginnings network did not immediately respond to a request for comment. Both Lafargue and Jones said they received flyers encouraging them to transfer to Capdau. Three years ago, when another New Beginnings charter closed its students were transferred to Capdau and did not receive closing school priority status. OneApp results are expected to be released this month. The Orleans Parish school district is closing five schools this spring. In the first part in a series on school closures, The Lens talks to experts, advocates and parents about how a decision to close a school is made, and how it should be made.